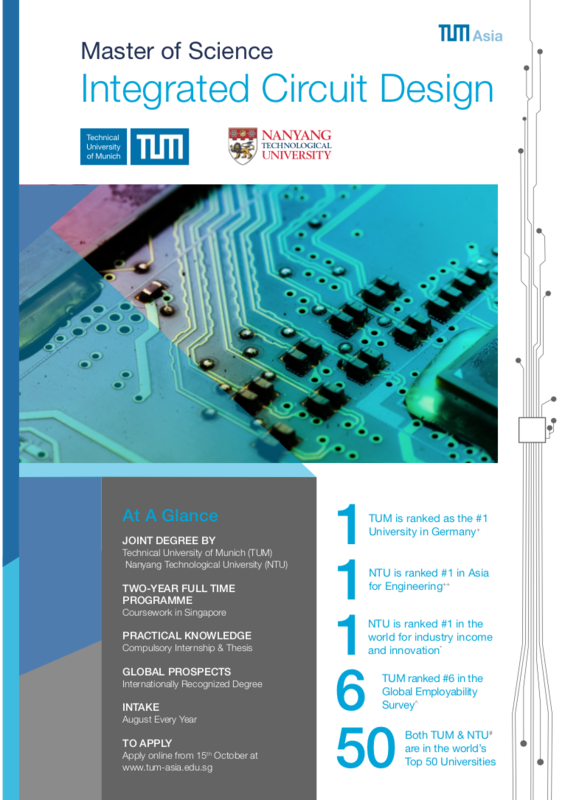 The international Master of Science in Integrated Circuit Design which is jointly offered by Nanyang Technological University (NTU) and Technische Universitaet Muenchen (Technical University of Munich, TUM) aims to educate the next generation of engineers and entrepreneurial leaders for the fast moving semiconductor industry. Changes in integrated circuits (ICs) technology have had a huge impact on our day to day life. Incredible technological advances over the last 50 years enable us to integrate billions of transistors on a single integrated circuit. At the same time the cost of a single transistor has decreased exponentially. The result is that every day, new attractive applications for the use of ICs open up, enabling the semiconductor industry to grow much faster than the overall economy. However, the semiconductor industry’s capability to make intelligent use of all these transistors in designing successful products has not kept pace with the manufacturing capabilities. The electronics and semiconductor industries are therefore constantly looking for well-educated integrated circuit design engineers. The 2-year full-time Master programme includes content that ranges from analog, digital and mixed-circuit design over architectural concepts for integrated circuits to design methodology and automation. Product manufacturing and testing are also addressed. Integrated circuit design is also placed in a broader context, by teaching fundamental concepts of signal processing which are at the core of today’s communications circuits. Students will also be taught essential non-technical topics such as product marketing, international management, patent law and aspects of culture and globalization. This will be mainly done by highly qualified lecturers from the industry. All information is accurate to the time of publishing. Updated March 2019. In order to be eligible for the programme, you must have at least a Bachelor Degree** (completed in at least three years, depending on factors such as the rest of your education background) in Electrical/ Electronics Engineering or in a closely related discipline with remarkable results. The Master of Science in Integrated Circuit Design degree is a 2-year full-time programme. Students must complete their coursework, 3-month internship and 6-month of Master Thesis writing to qualify for graduation. Introduction to Cadence design tools. CMOS high speed analog circuits, HF charakteristics of CMOS Transistors and integrated passive elements, low noise amplifier, mixer, VCO, prescaler, power amplifier, transceiver as complete system. An overview and a fundamental analysis of the building blocks of a Power Management ASIC (PMU) and their usage in the system is given. Synchronous digital circuit concept; description of sequential and combinational logic cells; basic components of digital circuits; state machines; simulation; synthesis, static timing analysis; implementation and test. Review of Integrated Circuit Fundamentals. Layout and Design Issues. CMOS Circuit designs. Low Power Design. BiCMOS Digital Circuits. Sub-System Design in Digital Circuits. Design Methodologies. Review of fundamentals. Noise. Modeling. Analog Building Blocks. Components Layout. Switched Capacitor Circuits. Current Mode Circuits. Transconductor. Auto-tunning. Gm-C and MOSFET-C Filters. Continuous-Time Filters. Switch Current Circuits. Class D Amplifiers. Computer-aided design of primarily digital integrated circuits. VLSI design flow. Overview of system level, algorithmic level, register transfer level, logic level, circuit level VLSI design methods. Focus on: logic synthesis, digital simulation, test. Techniques from discrete mathematics and computer science. Emphasis is placed on techniques that are applicable to very complex, industrially relevant circuits. Introduction. Discrete Fourier transform (DFT) and fast Fourier transform (FFT). Z transform. Digital filters. Linear prediction and optimum linear filters. Power spectrum estimation. Plastic Packaging Materials. Manufacturing Processes for Plastic Encapsulated Microelectronics. State-of-the-art Packaging Techniques. Failure Mechanisms, Sites, and Modes. Qualification Process. Accelerated Testing for Packaging. Effects of Packaging on the Electrical Performance. Future Trends and Challenges in Packaging. System Design Considerations. CMOS RF Components and Devices. Low-noise amplifier (LNA); Mixers; Voltage-controlled oscillators (VCOs). RF power amplifiers. Phase-locked Loops and Frequency Synthesizers. Trends in the IC industry: Technology and manufacturing trends, Demand applications and product trends. Market Characteristics: The customers, Business cycles, Demand lead and supply lag (the bull-whip effect), IC Industry, supply and value chain, stakeholders, Geographical distribution of excellence centers, Technology centers, design centers, fabrication centers, The dis-integration of the value chain, outsourcing trends. Managing the marketing function: The sources of product ideas, The role of standards, formats, and intellectual property. Strategic partnership, distributorship, Demand forecast, matching supply with demand. Historical development of mainstream MOSFETs until today; economical, technological and physical fundamentals; properties of long channel and short channel MOSFETs, hot carrier effects; short channel effects, scaling rules; basics of charge carrier transport (quantum mechanical, hydro dynamics, ballistics); proposed new MOSFET structures (strain engineering, metal-gate, high-k, vertical MOSFETs, double gate MOSFETs); hot electron transistors; tunneling transistors; low dimensional devices; single electron transistor, single electron memories, quantum electronics. Low dimensional structures: quantum wells, quantum wires and quantum dots. Electronic, optical, transport properties of nanostructures. Quantum semiconductor devices. Fabrication and characterization techniques of nanotechnology. Applications of nanostructures, nanodevices and nanosystems. The bottom-up approach to nanotechnology: introduction to molecular electronics and optoelectronics. Organic materials for electronics: self-assembled monolayers; conducting polymers; carbon nanotubes. Circuit implementations and architectures for nanostructures: quantum cellular automata and cellular nonlinear networks. Introduction to quantum computing. Fault Models and Testability concepts. Test Generation and Fault Simulation Algorithms. Shift-register polynomial division. Pseudo-random sequence generators. Special purpose shift register circuits. Random pattern BIST. Build-in boundary scan structure. Limitations and other concerns of random pattern test. Test techniques for automatic test equipment. Principles of circuit simulation: DC/AC/TR analysis. Basic analog optimization tasks: worst-case analysis, yield analysis, nominal design, design centering. Basic principles of optimization: optimality conditions, line search, Nelder-Mead method, Newton approach, Conjugate Gradient approach, Quadratic Programming, Sequential Quadratic Programming. Structural analysis of analog circuits. Application of a commercial analog optimization tool (WiCkeD) to an analog design example. DC analysis; AC analysis, Newton-Raphson; TR analysis, numerical integration; modified nodal analysis, linearized and discretized circuit model. Lagrange function, optimality conditions (constrained, unconstrained); classical worst-case analysis, realistic worst-case analysis, general worst-case analysis. Multivariate statistical distribution, transformation of distribution functions, expectation values, estimation of expectation values; statistical yield analysis, geometric yield analysis, Monte-Carlo analysis. Design objectives and derivatives, nominal design, tolerance design; yield optimization; design centering; structure of an optimization process. Univariate optimization, line search, multivariate optimization, polytope method, coordinate search; Newton approach (Quasi-Newton, Levenberg-Marquardt, Least-Squares, Conjugate Gradient; Quadratic Programming (equality/inequality constraints), Sequential Quadratic Programming (SQP). Hierarchical analog building block library, sizing rules. The module covers the following topics: the Organizational forms of enterprises – financing instruments (equity financing, internal and external financing) – methods of capital budgeting (cost analysis, net present value analysis, internal rate of return analysis) – corporate valuation procedures (discounted cash flow analysis, multiple valuation) – methods and requirements of internal and external accounting (national and international accounting standards, origin and allocation of costs) – human resource management (forms of organizing, history of organizational research, human resource theories, motivational theories). - Marketing communications, marketing channels, and service P’s. Students will work out, in teams, business cases, make their own business decisions and develop marketing concepts based on provided information of a real case study. The lecture presents the dynamics of technological development through innovation and the related management issues, the difference between creating a new product (invention) and improving an existing product/idea (innovation), Start-ups and financing of innovation, Innovation-driven economic cycles and Innovation impact on growth and jobs. This course is useful for students who plan to take up careers in manufacturing and service companies or in R&D organizations that make significant use of research and technology to build their portfolio. This module will give a brief introduction to intellectual property rights and focus on insights into general principles of patent law and international conventions governing the patent law. Current developments and criticism of the current patent law system will also be addressed. In addition, practical (legal) aspects of the commercialization of patents will be dealt with. The module will provide insights in the core elements of Industry 4.0 such as: introduction to Cyber-Physical System, Radio Frequency Identification (RFID) technologies, information collection with intelligent sensors, industrial networking to connect the machines and processes together, Manufacturing Execution System (MES) for order management, production control and value adding to the complete supply chain management. Manufacturers are confronted with special requirements of their production processes. Cycles, by-products, batches and campaigns are difficult to handle by nowadays ERP software packages (ERP = Enterprise Resource Planning). Concepts of material requirements planning, supply chain management (SCM) combined with basics in cost accounting will be explained. As a highlight a simulation model, based on modern simulation software, will be used by students to simulate production planning and achieve the ‘best’ production plan. *Disclaimer: Modules available for selection are subject to availability. Unforeseen circumstances that affect the availability of the module include an insufficient number of students taking up the module and/or the unavailability of the professor. TUM Asia reserves the right to cancel or postpone the module under such circumstances. The total tuition fees for this Master programme, if expressed in Singapore Dollar equivalent, are S$ 34,240.00* (inclusive of 7% GST). The tuition fees are to be paid in three instalments as indicated in the table below.